You are here: Home / Easy Recipes / Easy German Pancakes – in 5 minutes! 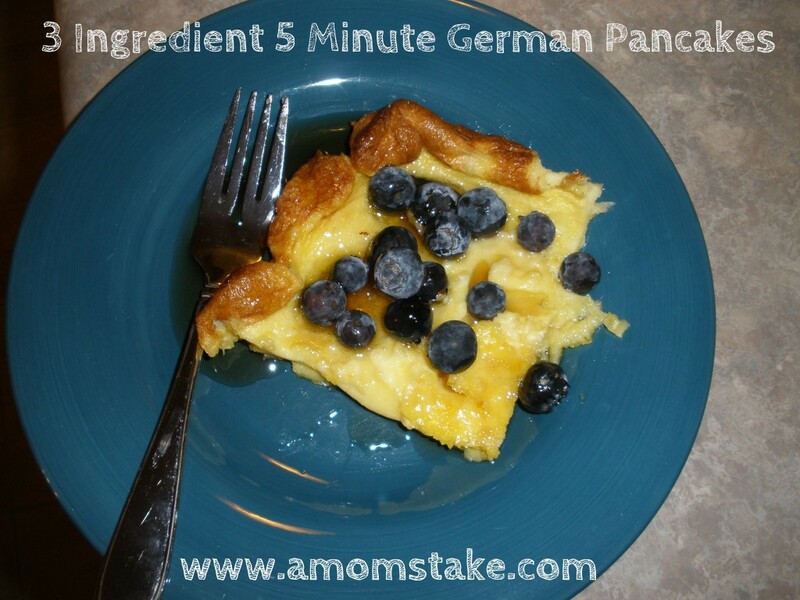 Easy German Pancakes – in 5 minutes! 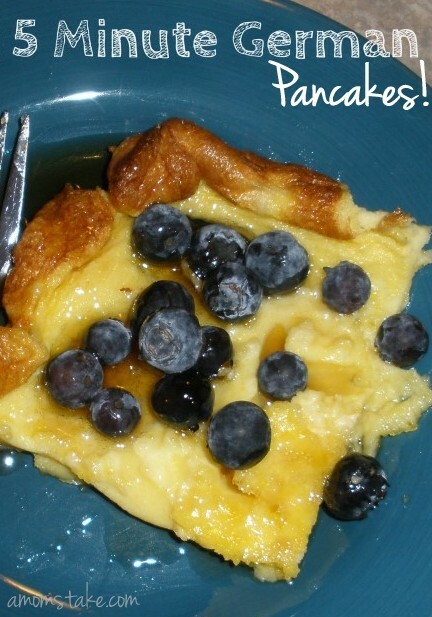 This German Pancake Recipe will make any meal a breeze! If you have 5 minutes of time to spare, and just a few key ingredients, this dish can become a reality in your home! Not only is the texture of this german pancake recipe spot on, it’s impossible to just take one bite! You’ll love the flavor and the texture of these delicious and easy German pancakes! The other night I realized that dinner time was rapidly approaching and there was still no food on the table. As I looked through my recipe books, I looked for something quick, delicious, and easy. I stumbled upon this German Pancake recipe; courtesy of an old college roommate. Combining three simple ingredients, this five-minute recipe became an instant family favorite! These German Pancakes are extremely filling, yummy, and simple! Enjoy! Remember, all you need are 3 simple ingredients! Once you have your ingredients, you start combining! Start by mixing flour, milk, and eggs in a bowl. Next, melt 6T of butter in a 9 X 13 pan and pour the mixture directly on top of butter. DO NOT MIX. Then, bake 15-18 minutes at 450 degrees. And once you start smelling that sweet smell, remove from oven and serve with fresh fruit of syrup! Q: What are German pancakes? A: While the name says pancakes, these won’t look or taste like American pancakes. German pancakes are an egg-based “pancake” where you bake an egg, flour, and milk mixture. Baking causes the pancakes to rise in a unique way. They’ll feel a little closer to a crepe than a pancake and are really filling. Q: What do you serve with German pancakes? A: German pancakes are great with a layer of butter and then a topping of lemon juice, fruit, powdered sugar, or syrup. You could also try topping with whip cream, chocolate chips, or peanut butter for more variety. Q: What are German Pancakes called, and why? A: German pancakes were first created in America and inspired by Dutch immigrants. They are also called Dutch baby or Dutch puff and were inspired by the German Pfannkuchen. Combining 3 simple ingredients, this 5 minute German Pancake recipe will become an instant family favorite! DO YOU HAVE A FAVORITE GERMAN PANCAKE RECIPE? Oh so easy and looks so yummy! Thanks for a great recipie! Those look really good. You are welcome to visit carrying a large platter of those pancakes. I’ll supply the syrup. I love German pancakes and have never made them before- I will now though! Yum! I’ve never tried German Pancakes. i will have to make these this weekend. These look fantastic, I know my kids would be thrilled, if I made them. Wow! These pancakes look awesome! I know how you feel. Sometimes dinner comes so fast, I don’t know what to fix. I might make these for dinner. It would be something different! These look so yummy! We are definitely going to have to try this recipe. Always looking for new recipes, this sounds great! Wow! This sounds wonderful for an easy weekend breakfast. OMG this looks delicious and so easy, thanks for sharing.